A-HOTEL.com - Halpa ja Hotellihuoneen Radomirë, Albania. Majoituksen varaus Radomirë ja ympäröivä. Boasting a garden and a shared lounge, Guest House Sabriu is situated in Rabdisht. All rooms boast a kitchen and a private bathroom. Offering an a-la-carte restaurant and a bar, Hotel Piazza is located in the centre of Peshkopi. The hotel offers free parking, free Wi-Fi and 24-hour front desk service. Boasting a garden, Korabi Mountain Camping is set in Peshkopi. Each room includes a shared bathroom. Set in Peshkopi, Hotel Veri features a terrace and a bar. Among the facilities of this property are a restaurant, a 24-hour front desk and room service, along with free WiFi. Situated in Peshkopi, Hoteli Llixhave Klajdi offers 3-star accommodation with a garden and a terrace. Among the facilities of this property are a restaurant, a 24-hour front desk and room service, along with free WiFi. Hotel Korab Trnica has free bikes and a garden in Trnica. Boasting a shared lounge, this property also provides guests with a restaurant. Featuring a garden, LURA Hotel is set in Peshkopi and also provides a terrace and a shared lounge. The property has a bar, as well as a restaurant serving local cuisine. Boasting a terrace, The House of the Mijaks is set in Rostuša and also provides a bar and on-site dining. This 3-star hotel offers a 24-hour front desk and free WiFi. Offering free bikes and a garden, Perfect Lodge House Mavrovo is set in Mavrovo, 9 km from Zare Lazarevski Ski Resort. Free WiFi is offered. Vila Mavrovo is situated in Mavrovo, 9 km from Zare Lazarevski Ski Resort, 6 km from Crven, as well as 6 km from Plav. Guests staying at this lodge have access to free WiFi and a terrace. Set in Mavrovo, • Spacious Villa ǀ Lovely View ǀ 5 Bedrooms • features mountain views and free WiFi, 8 km from Zare Lazarevski Ski Resort and 5 km from Crven. Each unit is equipped with a terrace, a fully equipped kitchen with an oven, a seating area with a sofa, a flat-screen TV, a washing machine, and a private bathroom with shower. Vila Jana in Mavrovo provides accommodation with free WiFi, 3,5 km from Mavrovi Anovi and just 10 metres from Mavrovo lake. Free private parking is available on site. Located in Mavrovo, within 12 km of Zare Lazarevski Ski Resort and 9 km of Crven, Ski Hut Gorica Mavrovo offers free WiFi. 9 km from Plav, the hostel features a tennis court and barbecue facilities. Villa Beti in Mavrovo provides accommodation with free WiFi, 7 km from Zare Lazarevski Ski Resort, 2.1 km from Crven and 2. Located in Mavrovo, 7 km from Zare Lazarevski Ski Resort, Yeti (snowman) Guest House features accommodation with free WiFi. All units have a kitchen, a living room, a shared bathroom and a terrace or balcony with views of mountain. Cece's home is situated in Mavrovo, 7 km from Zare Lazarevski Ski Resort, and a garden and a shared lounge are accessible in-house. The property features mountain and lake views. Situated 8 km from Zare Lazarevski Ski Resort and 1.8 km from Crven, Boss Lady features accommodation set in Mavrovo. 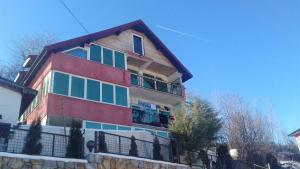 Located in Mavrovo, Mal Odmor features accommodation with a seating area, a TV and a kitchenette. Free WiFi is featured.